NYU ITP, Spring 2019. Instructor: Allison Parrish. Send me e-mail. Turn in meditations and projects here. 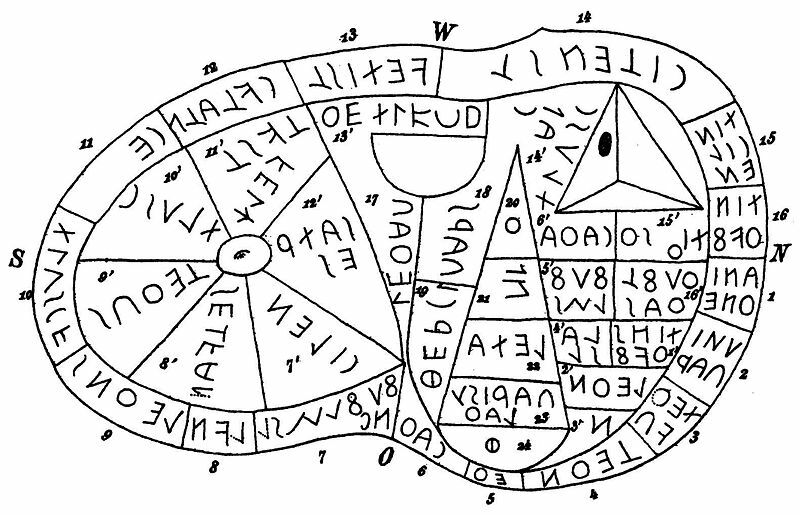 According to anthropologists Filip de Boeck and René Devisch, divination “constitutes a space in which cognitive structures are transformed and new relations are generated in and between the human body, the social body and the cosmos.” In this class, students will learn the history of divination, engage in the practice of divination, and speculate on what forms divination might take in a world where the human body, the social body, and even the cosmos(!) are digitally mediated. Starting with an understanding of ritual and folk culture, we will track the history of fortune-telling from the casting of lots to computer-generated randomness to the contemporary revival of Tarot; from reading entrails to astrology to data science; from glossolalia to surrealist writing practices to the “ghost in the machine” of artificial intelligence. Weekly readings and assignments culminate in a final project. Class schedule with readings, assignments and due dates. This is a critical making/speculative design class focused on the practice of divination. We’ll discuss and elaborate on topics related to this topic every week through assigned readings and in-class lectures and technical tutorials. You’ll be assigned a series of “meditations” on these topics, which encourage you to make something (an object, an intervention, a computer program) that engages with, expands upon and/or challenges the content of our discussions. We’ll spend a good deal of time in class “workshopping” the results of these meditations. By the last class session, students will be literate in practical and academic approaches to ritual and divination, especially as they apply to digital art and design. Students will have made several prototype projects that exercise this literacy and a final project that shows their mastery of the material presented in class. For the most part, the content of this class will be non-technical (i.e., this is not a programming class). Students are expected to bring their own technical know-how to their projects. The goal of the class is for students to be able to incorporate elements of academic and practical research in divination into their own practices as makers, designers and artists. Traditionally, Western academics have frowned on divination as a practice, considering it little more than unscientific superstition. Nevertheless, many of the readings we’ll be discussing in this class point to empirical explanations (whether cognitive, social, or biological) for the phenomenology of divination. These readings should not be understood as an attempt at “debunking,” but simply as a means to help us better contextualize and understand our experiences. For the fourth session, students will need to obtain a Tarot deck. A traditional, Rider-Waite-style 78-card deck is preferred. Here’s a helpful but not exhaustive list; you probably can’t go wrong with any of these decks. Nothing wrong at all with going for the classic. There are no required textbooks, but for students particularly interested in Tarot interpretations, I highly recommend The Little Monsters Tarot Guidebook (also available as an instant digital download). In the incarnation of this class in Spring 2017, the students came up with a collective bibliography of works and writing on topics related to this class. This bibliography is available online (PDF). Each unexcused absence will deduct 5% from your final grade. If you have three or more unexcused absences, you risk failing the course. Be on time to class. If you’re more than fifteen minutes late, or if you leave early (without my clearance), it will count as an unexcused absence. Five “meditations” will be assigned, one every two weeks. Each meditation encourages you to make a project related to the technical and conceptual material under discussion in class. The form and content of each meditation response will be determined by the weekly descriptions in the schedule. Meditations must be turned in at the beginning of the session listed as the due date in the schedule. Work turned in after the deadline will not be accepted. Work will be evaluated according to the following criteria: compliance, gregariousness, and stubbornness. An assignment is compliant if it meets the brief. An assignment is gregarious if it makes connections between course content and the rest of the world; e.g. your own interests as an artist, designer, technologist, etc. and/or other fields of research and practice. An assignment is stubborn if it provides evidence that its maker was opinionated about what they wanted to accomplish and did not let small setbacks (whether conceptual or technical) deter them this end. Each assignment will be assigned a score of 0, 1 or 2 in these categories, in accordance with the extent to which the assignment demonstrates the properties described. Each category will be weighted equally when assigning a final score to each assignment. The final project has no set requirements, but I will evaluate your project based on how well it demonstrates your mastery of the technical and conceptual content of the class. You must document your final project in a blog post and include a link to your source code. Additionally, you will present your final project on one of the two final sessions of class. Plan on a presentation that lasts from ten to fifteen minutes. Here’s the breakdown of how grades correspond with percentages. Note that the completion of all components of the class is necessary to earn a passing grade. For students taking the class as pass/fail (i.e., all ITP students), anything below a B (79% and below) will be graded as a fail. More information on ITP’s grading policy here.